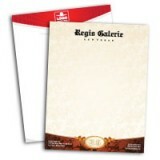 All Letterhead stock is 10% recycled material. Complete your business package with Premium Letterheads. They are printed on 70Lb Premium Bright White, Heavy Bond Paper or the 70Lb Linen Text gives you a parallel feel and texture. Linen Text assures a truly Distinctive Touch.